Since 1996, Rising Sun Farm has been breeding Border Collies, Australian Shepherds, and Bengal Cats.Our animals are highly sought after around the world for their intelligence, structure, temperament, and trainability. 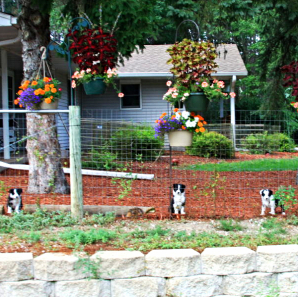 We are an AKC Breeder of Merit, and are committed to meeting and exceeding the guidelines set forth by the AKC regarding membership, health screening, and animal registration.We are also proud members of the International Sheep Dog Society, the American Border Collie Association, the Australian Shepherd Club of America and The International Cat Association. At Rising Sun Farm, we take pride in breeding animals that consistently produce championships in herding, agility, and obedience competition, but our main focus is breeding happy, healthy dogs and cats that meet or exceed the breed standard. 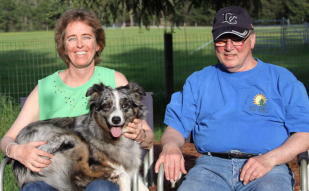 Becky and Steve are professional breeders who live and work on site.We have over 30 years of experience and are committed to advancing the breeds we work with.Becky is a certified ASCA and AHBA judge. Contact us today for more information about any of our animals, our breeding programs, or purchasing information!